A herniated disc can be quite painful, especially if the herniated material compresses nerves. If you’ve experienced persistent back pain that may be accompanied by shooting pain, weakness, and numbness in other areas of the body, you might consider visiting a spine center near you in Miami. A physician can explain your herniated disc treatment options, which can include conservative and surgical treatments. Patients with a herniated disc are generally advised to try conservative treatments for at least the first six weeks. Some patients respond well to medications such as nonsteroidal anti-inflammatory drugs (NSAIDs). In severe cases, patients may be prescribed a short course of corticosterone medications such as prednisone and stronger pain relievers such as COX-2 inhibitors or narcotics. An epidural injection can deliver anti-inflammatory drugs directly to the area of the herniated disc. In addition to medications, the spine doctor may refer patients to a physical therapist. A customized series of gentle stretches and exercises can reduce the pressure on the nerve root and alleviate symptoms. At home, patients can try alternating cold and heat therapy to relieve the pain. If the patient’s symptoms are not sufficiently relieved with conservative treatment options after about six weeks, it may be time to consider surgery. An orthopedic surgeon will determine the best surgical approach for each individual patient. One type of surgery that may be helpful is disc decompression or discectomy. 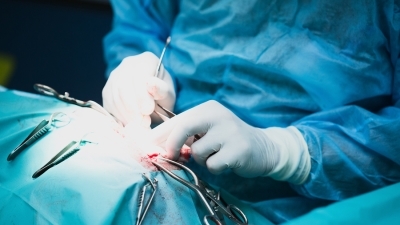 A discectomy may be performed in conjunction with a laminotomy or laminectomy. This involves the removal of the lamina, which is the back portion of the vertebra. In a laminotomy, the surgeon removes the entire lamina. A laminectomy involves removing only part of a lamina. Removing this small piece of bone allows the surgeon better access to the herniated disc. Then, the surgeon can remove the herniated material during the discectomy. Following the discectomy, the surgeon may need to stabilize the spine with a spinal fusion. This typically involves inserting surgical hardware such as a plate and screws to fuse the two vertebrae together. A bone graft may also be placed at the site.